This photo doesn't show a lot of the birds' details, but they are just too cool not to post. 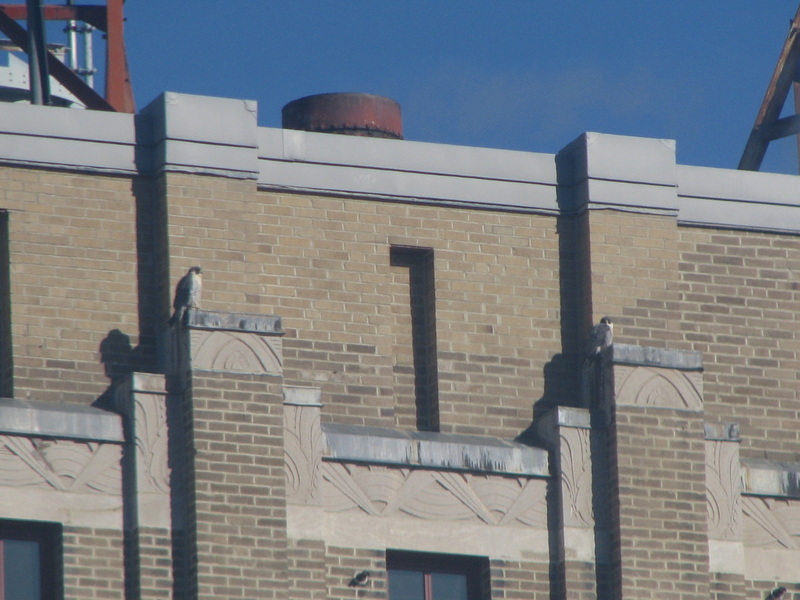 This couple sun and hunt from the Fairpoint Building in downtown Bangor. This is the third year I have had the opportunity to observe them. The building is on Harlow Street and right across the street from our office. For better photos, visit our Birders blog page from December 2014. Peregrines are about 15 to 20 inches tall - a little bigger than a crow. The fat sideburns (or as Peterson's states "strong mustache mark") are an easy way to distinguish them from other falcons.While in flight, look for pointed wings, a long tail and quick, powerful wingbeats.